"It's time to take air guitar out of the bedroom and onto the world stage." I've been known to play an assortment of air instruments, ranging from guitar, keyboards and drums, all to compensate somewhat for natural lack of any sort of musical ability. 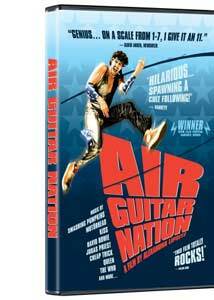 That doesn't mean I love rock and roll any less, and it goes hand-in-hand with that unquenchable desire to get up on stage that director Alexandra Lipsitz bravely celebrates with her 2005 doc Air Guitar Nation. In it she follows a pair of U.S. competitors in 2003 as they make their way from regionals in New York to U.S. finals in Hollywood, and hopefully onto the world championship stage in Finland. The focal points of Lipsitz film are David "C-Diddy" Jung and Dan "Bjorn Turoque" Crane, rivals of sorts, both of whom achieve a modicum of fame after the inaugural regionals in New York, as U.S. promoters Kriston Ruckner and Cedric Devitt work the press as they get the public excited about selecting a finalist to head to Finland. And as we learn, all air guitarists have colorful personalities they perform under (names like Krye Tuff, The Shred, The Magnet, Air Raid), or as one rocker says "it's an alter ego, like a superhero." With only sixty seconds to uncork a frenzied performance, these rock star wannabes leap, kick and tumble their way, becoming a cross between mad flailing and carefully orchestrated movements that resemble shredding through a hot solo. It looks like a hell of a lot of fun, and the crowds cheering them on seem to have as much fun as the performers do. Without giving too much of the built-in drama away, suffice to say Lipsitz' cameras make their way to the championships, and closely follows things like the mock rigors of a training boot camp, where people such as "legendary" air guitarist Zac Monro lead the 2003 finalists through calisthenics, groupie etiquette and even a Zen-induced session to help them all achieve "airness". The whole process is treated with mixture of seriousness and beer-fueled camaraderie, yet when time comes for the finalists to get up in front of 5,000 people it is put up or shut up time for all involved. It's tough to take all of this air guitarness completely seriously, yet despite that Lipsitz wisely treats the whole thing as completely legit, without the kind of outright mocking that could have rendered this as a "let's laugh at the goofs" kind of doc. Instead, we get to know a few of them, and eventually understand that underneath all of the flamboyant fun and theatrics, seemingly all of them just to earn a title so they can say they were the world's best at something. And it's hard to knock that kind of personal drive, silly as it may seem. There's a slogan bandied about at the world championships: world peace, air guitar...forever. Maybe a little high falutin', because I'd just say rock on, my friends. Air Guitar Nation shows us people ostensibly doing things we all can do, or probably have done to one degree or another. But like karaoke, it takes a certain sort of individual to make that next step up and perform in front of an audience, and the characters here make it look like a lot of fun. Image Transfer Review: Air Guitar Nation comes from Docurama in 1.33:1 fullframe. Colors are somewhat smeary in spots, but given the doc is built from footage taken under a number of less-than-perfect conditions, the overall quality is certainly tolerable. The talking head interview segments, shot under more controlled environs, look the strongest, with more defined edges and consistent fleshtones. Audio Transfer Review: Two audio choices are available, in either Stereo PCM or Dolby Digital 5.1 surround. Not much difference when it comes to the talking head portions, but the preferred option here is the 5.1 blend, which provides a big sound to the hard rocking soundtrack/music used when the air guitarists perform. Extras Review: The backcover proclaims extras include "behind-the-scenes footage, additional air guitar performances, where are they now? updates and deleted scenes", when in actuality there's just a block of 12 deleted scenes running 36m:34s. Some of these could be considered behind-the-scenes and there's a bit of "where are they now? ", including a funny television commercial for David "C-Diddy" Jung's unusual post-air-guitar career. There's a few Docurama trailers and 12 chapters stops on the feature. Air Guitar Nation is for all of us who've ever strummed along on an invisible guitar to a favorite song, as director Alexandra Lipsitz follows a pair of colorful competing U.S. competitors trying to reach the World Championships in Finland. You can't stop rock and roll, even if you don't have an instrument.